From my brief read of it, it's just a SAN with redundancy. ZFS already does that, and can also handle logical volumes instead of just physical drives (e.g. you can allocate space on one drive to multiple redundant volumes). For your example, your 5x3TB drives hold 15 TB of data. You could create a logical volume of 20 TB and assign them to it. But if you tried to add more data to it (or tried to add redundancy), the OS would tell you you need to add more physical storage. The point of being able to assign more space than you physically have is to (1) account for compressed filesystems, (2) share empty space, and (2) for future expansion. (1) You can't predict ahead of time how much space compression will save. If I have a 3 TB drive, I can't say ahead of time exactly how much data it'll hold. Maybe it'll only hold 3 TB of movies, or maybe I'll manage to squeeze in 6 TB of sparse data. Telling the OS that it's a 5 TB volume is really just a way to tell the OS to set it up to store a maximum of 5 TB of data. (2) When multiple volumes reside on the same physical drive, directly assigning empty space to a specific volume is wasteful. e.g. Take the example of a 500GB drive with an OS partition and a data partition. When you first bought the computer, you thought you'd never use more than 100 GB for the OS and programs, so you assigned 100 GB as an OS partition and 400 GB as a data partition. A year later, your OS partition only has 5 GB free, while the data partition still has 200 GB free. You guessed wrong and you're cramped for space on one volume, while you have lots of free space on the other volume, even though they're on the same physical disk. To fix it you have to dynamically resize the volumes, which takes a long time and carries with it the risk of data loss. And if after you repartition the situation should reverse, you have to repartition again. Instead, what you can do is divide the 500GB physical drive into two 500GB volumes. So the OS volume can take up to 500GB, and the data volume can take up to 500GB. The only constraint being that the OS + data cannot exceed 500GB. The two volumes are effectively sharing empty space, so you're free to let either of them grow or shrink to anything from 0GB to 500GB without having to repartition. 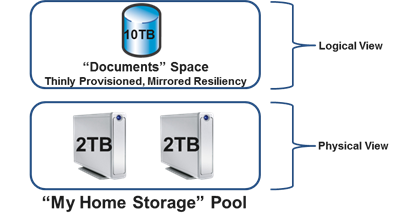 Redundancy with two drives requires mirroring - you have two copies of the data, so it takes 2x as much space. So if one drive fails, you still have the other copy. Redundancy with more than two drives requires a progressively smaller amount of parity data. With 3 drives, the parity data is 50%, so you need 1.5x as much drive space as you have data. Once you have parity data, any one of the three drives can fail and you can reconstruct it using the surviving data and parity information. You can't install the operating system on "Storage Spaces" which basically makes it a nice to have, but not really useful. You still have to go through all the Windows hassle to create a hardware RAID that you can install the OS to, and then you are limited by the physical size of the RAID disks with respect to your C: partition. I've been waiting for decades for Windows to support separate volumes for TEMP:, Users, paging, and Program Files. The only thing that has happened is that we now have two Program Files directories that can't be moved off the boot volume. (Yes, you can move individual directories for large programs to other volumes, but you can't have a link that makes it not a bother. In fact, since Windows will chomp a 100 MBytes (which isn't that much) off your boot device if Windows is elsewhere, it would be really, really nice to assume four (or more) main directories, and have redirects in that partition, or the main boot partition. if they are located elsewhere. How much work is that? The problem is that it has to be done early in the boot process so there is no easy way to hack it. It is still a disk-based and not file-based approach, so it is not quite like WHS Drive Extender. Seems more like just an "unRAID" implementation for windows. Not bad.